February 20, 2012 — EVANSTON, ILL. — This season a new voice welcomes the Northwestern University Women's Basketball team each time they hit the court in Welsh-Ryan Arena. Yet, many Wildcat fans probably recognize the you-can-hear-the-smile inflections of rookie basketball announcer Pete Friedmann (C79). After all, he's been the Voice of the Northwestern University "Wildcat" Marching Band for more than three decades. "Although I’m a professional announcer, voice over artist and former broadcaster, I’ve never really announced sports," says Friedmann. Nonetheles, someone saw—or rather heard—potential in Friedmann. When the call for auditions went out, he tried out "like anyone else," he says. He got the job. "My wife and I have been going to NU Women’s Basketball games for at least 20 years," he says. "I would be there for most games anyway, and I liked the idea of trying something new and challenging along the way." 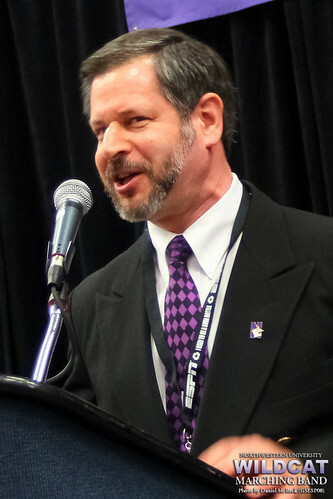 Although Friedmann has been in the announcer's box at hundreds of Northwestern athletic events, he has always had the benefit of knowing ahead of time what the Wildcat Band planned for its performances. "The excitement in being a sports fan is that you never know until it happens," he says. "The biggest challenge for me—besides not being able to cheer for the ‘Cats and sing along with NUBB [the basketball band]—is keeping track of everything when it seems it’s all happening at once, and trying to announce it in a timely manner." While Friedmann works from a script with the marching band, often counting footsteps and drumbeats to time his announcements, the flow of a basketball game is a bit more frantic. January 23, 2012 — EVANSTON, ILL. — Dozens of band alumni will once again don purple shirts and ready their instruments to play in support of Northwestern basketball this Saturday, Jan. 28., as the Wildcats challenge Purdue at Welsh-Ryan Arena. 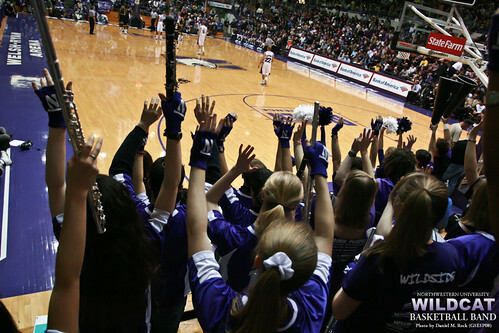 The Wildcat faithful will perform alongside the Northwestern University "Wildcat" Basketball Band. "Director [of Athletic Bands] Dan Farris has been kind enough to invite the NUMBALUMS to play with NUBB for one Big Ten game each season the past couple years," says Brittany Petersen (J09), Vice President of Publicity for the NUMBALUMS. "We're not about to let a good thing end!" The NUMBALUMS organization, which includes alumni from all of Northwestern's band programs including the marching band, asks interested alumni performers to register on their website before midnight this Friday. 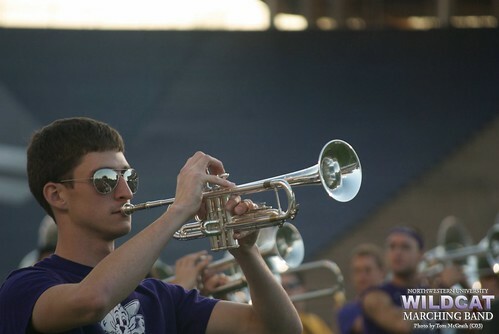 January 12, 2012 — EVANSTON, ILL. — Photo loving fans of the Northwestern University 'Wildcat' Marching Band are discovering the ensemble's new photostream on Flickr. "We launched it just after the last home game," says the band's Director of Web Media, Daniel M. Reck (GSESP08). "Over one hundred official photos from the Meineke Car Care Bowl trip are being posted over the next few days." Many of those photos were taken by Tom McGrath (C03), the Wildcat Band's Director of Photography, who was assisted by Reck during the trip. Both are NUMBALUMS. "I started working with NUMB several years ago," says McGrath, who is also owner of TCMcG Photography, which has provided professional headshots for Northwestern students launching their musical and artistic careers. His images and videos have been used to promote the band on campus and the band's website. As more social networks emerged, it was time to find a "broader way to showcase and distribute Tom's work," Reck says. The new Flickr-based stream was selected for its easy accessibility and social features. "Fans can go out right now and start commenting on photos," says Reck. "In fact, they can also contribute their own favorite shots." December 31, 2011 — HOUSTON, TEXAS — "HEY BAND!" shouts the SpiriTeam of the Northwestern University 'Wildcat' Marching Band. "HEY WHAT? ", the 160 musicians reply. For the fourth year running, and the second in a row in Texas, the Wildcat band is performing in at a college bowl game. At 11 a.m., Northwestern University will kickoff on the gridiron against Texas A&M University. The teams both have 6-6 records leading into the game, which will be broadcast on ESPN. For the band and the team, the day will start much earlier. Early risers in Houston will see an impromptu parade of purple and white as the Wildcat band makes its way down the street from their hotel to greet the team. "We'll find a spot to warm up and say 'Welcome to Northwestern' to some unsuspecting Texans along the way," says Director of Athletic Bands Daniel J. Farris. 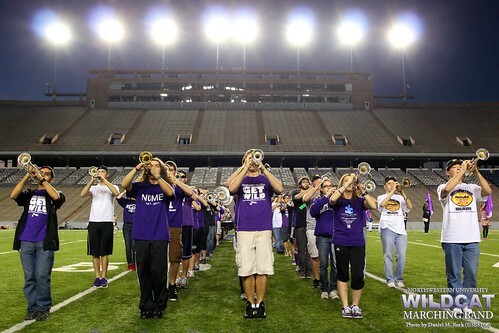 December 29, 2011 - HOUSTON, TEXAS - One thousand miles from home, clad in purple t-shirts and shorts, members of the Northwestern University "Wildcat" Marching Band still worked up a sweat as they rehearsed their fast entry... again. The temperature at the Rice University stadium was a relatively balmy 54 degrees, compared to the usual teeth-chattering weather back home in Chicago. "Okay band, we have just three more rehearsals and then we're doing this for real." The words of Director of Bands Daniel J. Farris echoed through the empty stadium as band members scurried to their next rehearsal positions. With a compressed time limit for both the pregame show and the halftime program, the band is working hard to adapt to rapid-fire drill changes. The footwork is not the only thing changing in this post-season game. 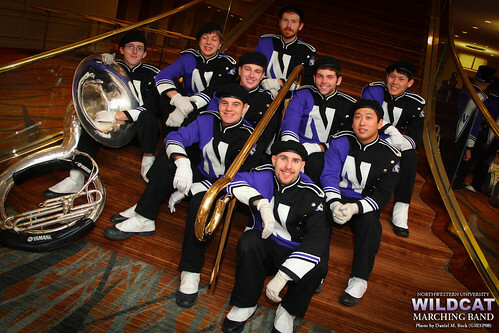 NUMBALUMS reminisce; Wildcat Band plays for NU "Fútbol"
Coach Fitz: "Jump into the best band in the country"